A hike in Sugar Pine Point State Park offers grand stands of sugar pine and lush mountain meadows ringed by aspen. Enjoy picnicking along General Creek and an escape from Tahoe crowds. Sugar Pine Point’s trail system offers numerous options for hikers of all abilities and energy levels, with trails extending to the state park boundary, then into the El Dorado National Forest. Turn-of-the-20th-century banker Isaias Hellman built “the finest High Sierra summer house in California” a rustic, yet elegant three-story mansion overlooking the lake. Now known as the Ehrman Mansion (for a later owner) the house is now part of the state park and open for guided tours during the summer months. Exhibits about the natural history of the Tahoe Basin can be viewed in the park’s nature center, located in the Ehrman Mansion’s former power-generating plant. The hike: Follow the paved pathway toward the campground. You’ll soon spot a signed trail leading east to the lakeshore part of the park. Continue toward the campground and your rendezvous with General Creek Trail. Trailside interpretive panels point out the locale’s history as a site for the Nordic skiing venue during the 1960 Winter Olympics. The paved path crosses the first campground access road (leading to sites 1-75) then leads to a second camp road (leading to sites 76-125). Past the road, join the dirt trail that swings left (south) and soon meets Creek Trail. Turn right and soon meet up with General Creek Trail, a dirt road. The wide path leads west along the north bank of General Creek. At a signed junction you’ll spot a trail leading down to a bridge crossing the creek. This bridge, and another bridge two miles farther along General Creek Trail, allow a pleasant loop trip without getting your feet wet. The trail meanders through well-spaced stands of Jeffrey and sugar pine and across meadowland seasonally sprinkled with lupine and aster. Sugar pines were once even more numerous. In the 1870s, there was lots of logging in this part of the Tahoe Basin in order to supply Comstock Lode miners with lumber and firewood. The great naturalist John Muir described the sugar pine as the “king of the conifers”. Muir found the tree’s sweet resin, which gives the tree its name, preferable to maple sugar. This tree is the largest species of pine, commonly growing 130- to 200-feet tall, and with a trunk diameter of five to eight feet. Its needles are in bundles of five. The sugar pine has long straight branches, weighed down at the tips by the cones. Sugar pine is notable for having the longest cones of any conifer (10 to 20 inches long). One of Lake Tahoe’s first permanent residents was “General” William Phipps, who homesteaded the land we now call Sugar Pine Point in 1860. Phipps protected his 160 acres from being logged. Those granite boulders you see looking so out of place in the sylvan scene were left behind ages ago by a retreating glacier. Hikers with an interest in geology will enjoy glimpses of the two large lateral moraines that border the valley of General Creek. A bit more than two miles along, when you reach a second footbridge, you can loop back to the trailhead via a path on the opposite side of General Creek. This makes for a fine family hike, as does the longer hike to Lily Pond, and leaves plenty of time for a visit to the lakeshore. Soon after passing the bridge, General Creek Trail dwindles to a footpath and another half-mile’s travel brings you to a signed junction with a side trail leading to Lily Pond; it’s a 0.75-mile, heart-pounding ascent to the little pond. For families and those fully satisfied with a moderate hike, behold the pond lilies and head back to the trailhead. Those bound for the lakes will retrace their steps to General Creek Trail and continue meandering above the creek. 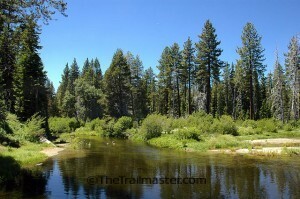 About 3.5 miles from the trailhead, you’ll exit the state park and enter El Dorado National Forest. The park is often used by long-distance hikers to gain access to the northerly part of the Desolation Wilderness, as well as to intersect the Pacific Crest Trail and other paths leading into the High Sierra backcountry west of Lake Tahoe. After more meandering, the trail/dirt road crosses General Creek (no bridge this time), turns south, then east, and after a mile crosses the creek fed by Lost Lake and Duck Lake. Now the trail turns south again and climbs to the forested south shore of Lost Lake. Duck Lake is another 0.2 mile along the trail. Both scenic lakes offer good swimming. Retrace your steps to the trailhead. This time on the tree tour, keep an eye out for the stately white fir. In autumn, the black cottonwood and quaking aspen are something to behold.